Titanium Swift frame, anyone interested? No problem on that, I think. Single orders from the company would probably be no problem wrt paying extra, I think I would be able to persuade them to give us the quantity price even for single orders now that we've pushed through a batch. Jur will you be confirming the next batch soon? I am interested but how long will I have to decide? In bed now and will read up on more details tomorrow. I am now getting the drawings ready, so still lots of time before it's too late. At least some weeks. It depends on me getting into gear and doing the drawing mods, because so far only one party has responded with modded drawings. So it's up to me now to send around emails to each interested party with a pick list of specs. That's how we did it with the previous batch. Thanks, I will do the research and get back to you on this soonest. Great idea! Jur. I need 50 posts to reply on your private message. I'm interested in a frame but of course have a few questions about when the money is due and how I designate my specific requests. My biggest interest is to have the frame and forks made to accept 20 x 2.4 tires. Would you please PM your email this way I won't need to publish mine. Thanks. 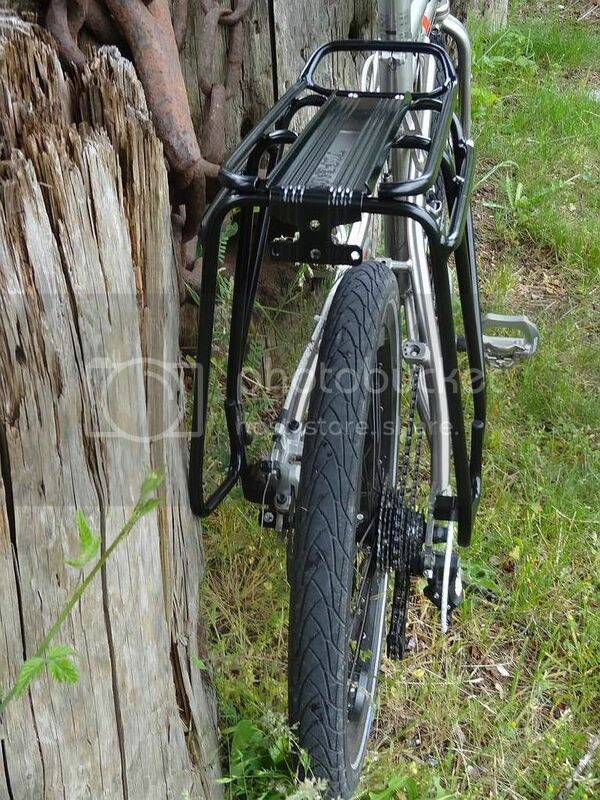 Finally found a rear rack that fits with the rear disk brake on mine. Topeak Super Tourist DX for Disk Brakes. Another pix on the "Folders in the Wild" thread. Not terribly light, but great design and build. Claims to hold 25 kg which should be enough. Still working on getting a rack on the front, but that is just a matter of getting one more bolt which is the right length and then finishing making up my mind about what fenders I want. No tours planned at the moment, but it is good to be prepared! This is my 2nd Ti Swift, I basically moved most of the parts over from the 1st frame. The front has a disc brake with TRP Spyre calipers, very nice, those, and the front wheel is my winter wheel with SP dynohub and an B&M Eyc headlight. This is the 1st frame built up as an urban/commuter bike, with Automatix hub. I just installed my custom 58T Ti chainwheel. Polished Ultegra crankset. I fixed the misaligned seatpost issue on the 1st frame. Last edited by jur; 06-29-15 at 06:43 PM. How are the commute times with the new TI commuter compared to the 2 speed Brommie? I haven't done the Brommie often at all on my work commute, but I think the Ti Swift is about 10% faster. I will try it out a few times this week, Friday at least, to see. I love the lines on this bike! It has such a minimalist style- great job on the design! Thanks - it is the result of a few iterations on my Xootr Swift frame. Nice job all around. I haven't had a look through the entire thread so please forgive the ignorant question... Do they still fold? Yes, same as the original. However the steering setup is slightly more complex but handled correctly, also amounts to same. Hi Jur. very nice second build. :-) good job. How can I get my hands on a Ti Chainring as yours? I got the chainring from XACD. I had it made from 4mm Ti, with two sides identical, so it can be turned around when worn. The teeth are quite long so it is good for singlespeed or a single ring setup. I haven't tried a derailer with it; I suspect it might not shift that easily. One of the nicest looking folders I have ever seen. Beautiful yet simple. What would it cost to build one of these up and are they even available at this point? They are available at any time at all. I was organising a 2nd batch but all except 1 fell away. I put that chap in touch with the builder and he's doing the deal himself. You could probably pick the frame, fork and seatpost up for $1100 or so. Just my 2nd post on Bikeforums. I want to say that the way you set it up is among the most elegant bike I have seen. Aesthetically, it looks sleek and light as a feather. Beautiful. For the owners who have now set up, how does this compare with your aluminum framed Xootr in terms of stiffness/efficiency? I know, you probably did not purchase this for the efficiency but more for the concept. Also, how is the weight compared to the regular Xootr frame/work? The weight of the aluminium Xootr Swift is 2.6kg, the Ti Swift 1.9kg. I over-designed the tubing to be at least as stiff as the Xootr version. Calculations show it is about 40% stiffer for torsional force along the main frame part. Riding it confirms it is at least as stiff as the aluminium version which I was always impressed with. Once you also factor in the weight of the other frame parts, that is the seatpost, fork and stem riser, the Ti Swift is way lighter. I haven't actually weighed all these bits together, but from memory, the steel Swift fork is 1.8kg all by itself. The Ti fork is around 600g. For the custom frames, may I ask how many just went with standard Swift frame dimension and how many modified it? Is see at least one increased the top tube length. Does this also increase the wheelbase by the same amount or doe they adjust the tube angles to keep the wheelbase the same? This is a very intriguing build. So far, all except one case took longer top tubes. Of those, PineCone took 590mm, the rest are 575mm. Nothing is adjusted so the wheelbase becomes longer. It is much more stable than the Xootr Swift, I can ride no-hands and take my jacket off. With the Xootr that won't happen. I will weave all over the way.